Lateral epicondylitis, often referred to as tennis elbow, is an inflammation of the tendons in the outer elbow. 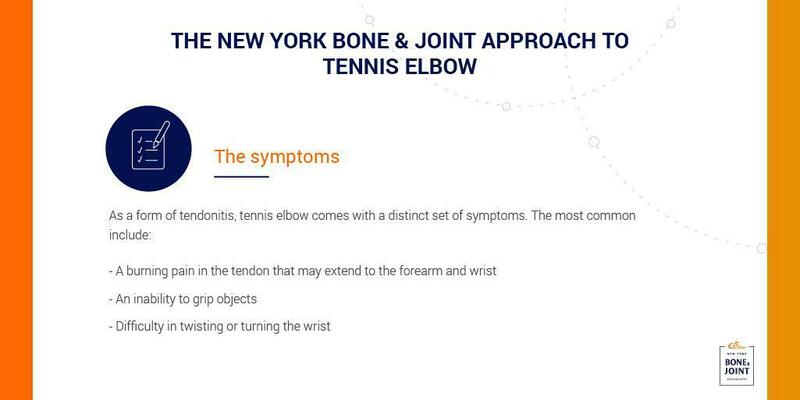 Like many forms of tendonitis, it’s caused by overuse of the elbow and forearm, usually (but not exclusively) during tennis, badminton, and other sports involving rackets. While this condition can result in debilitating pain, most patients can easily manage their symptoms and continue to enjoy their favorite sports with some simple conservative measures. The most common symptom of tendonitis is a burning pain in the affected tendon. The pain is usually confined to the outer elbow, but it can extend to the forearm and wrist. Most cases of tennis elbow are best treated conservatively. Indeed, the vast majority of patients enjoy a complete recovery with some combination of rest, anti-inflammatories, and a physical therapy program centered around tennis elbow stretches and strengthening exercises. Many patients further benefit from wearing a customized tennis elbow strap or brace, both of which can prevent additional damage by stabilizing the muscles and tendons in the elbow. Tennis elbow rarely needs to be treated surgically, but some patients with longer lasting symptoms may have a muscular or structural defect that’s best addressed with a minimally invasive procedure. During the operation, your surgeon will make several small incisions into the elbow, view the affected tendons with a small telescope, and debride or remove any permanently damaged tissue. Recovery timelines for patients with tennis elbow vary, but they tend to be slightly shorter with conservative treatment and slightly longer with surgical treatment. Patients pursuing conservative treatments can usually begin physical therapy after two to four weeks of rest, and complete recovery should follow after four to six weeks of rehabilitation. In contrast, patients undergoing surgery can begin physical therapy about two months after the procedure and resume most athletic activities after four to six months.